To start with we’re offering a chance to win a FREE all-inclusive camp with Colby West as your mentor. The Bonus is – you get to make your own video edit starring you and Colby! For more details click here. 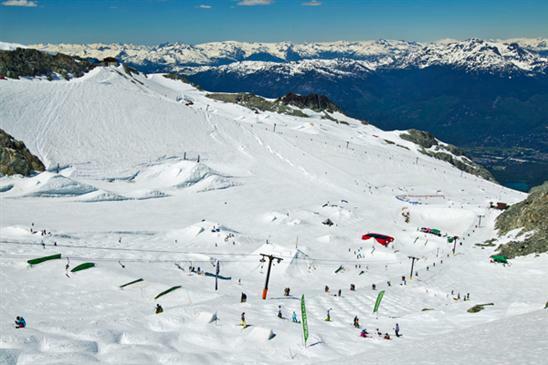 Yes Whistler has been getting pounded with snow again, but in terms of performances in the snowfields, 2011 has racked up some amazing results for both Momentum coaches and our former campers! At the recent X-Games and Freestyle World Championships we collected a staggering 7 GOLD medals! in Half Pipe, Slopestyle and Moguls. Congrats to the new reigning champions, Mike Riddle, Roz G, Sarah Burke, Kaya Turski, Alex Bilodeau and Jennifer Heil. Congrats also to all the great World Cup, Noram and Dew Tour results from our other staff and campers! We are stoked to welcome many of them back to coach YOU this summer! With the largest and most diverse skiing-only terrain offering both moguls and park, a T-bar than rips right through the middle of the camp with the fastest turnaround time, and a creative park designer that builds the safest and best hits of all, the Momentum park is a playground geared for fast progression. Now that WB has purchased a 22 foot halfpipe zogg we are planning to include a 22 foot double hit 1/4 pipe into our airbag. A proposal is also in place for the public pipe to be built with this zogg and we would have exclusive morning access. We’ll also be adding some new unique rail works to the yard. Our giant Airbag will be back to ensure you can safely test your tricks before taking them to snow. This year we’ll also have access to the new Olympic Foam Pit facility, plus of course we will be making heavy use of the Whistler Water Ramp again. Check out the new video gallery and latest edits including The Mogul Evolution and Faces of Momentum . Last year we stepped up and I think all would agree produced some of the best session edits ever, this year we plan to do more including adding a special gallery for campers to post and showcase your own edits. We will also provide some of the tools you may need to edit and upload your creations. Special attention is an understatement when it comes to this week and last year’s Girls Week was too much fun for all to not do again. This year we couldn’t stack the deck of coaches any better – we have every current 2011 X-Game or World Champion you can ask for! Starting with our Freeride team leaders Sarah Burke (X-Games Gold Half-Pipe), Roz G (World Champs Gold Half-Pipe) & Kaya Turski (X-Games Gold Slopestyle) along with Meg Olenick and Kristi Leskinen. We also expect to have Kristi Richards and Chelsea Henitiuk back for moguls. 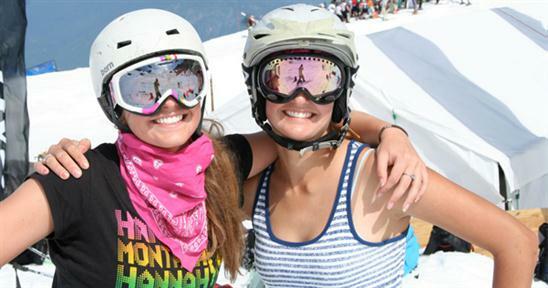 Kristi has won multiple World Cup medals, is a former World Champion and won bronze at this year’s Worlds and Chelsea is dominating the NorAm tour. For more detailed info visit Girls Week. This event was a HUGE success for the skiers, the campers and the communIty of Whistler last summer. The event is here to stay now and we expect crowd control issues as we continue to make plans to try and make this event even better. July 5th is the planned date for the 2nd annual Momentum Slashdown. Check out the Splashdown edits from last year. 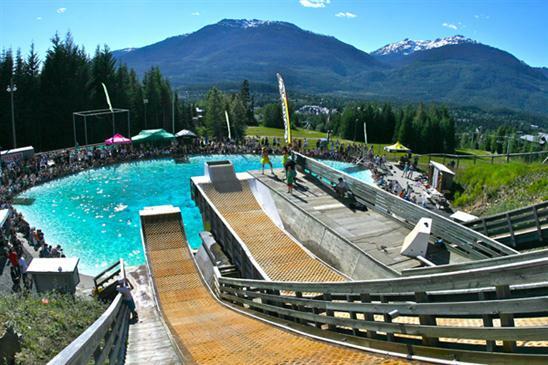 Watch our campers and coaches soar, spin, flip and splash in spectacular fashion off the Whistler Water Ramps! Last year Mike Riddle took the crown with a double cork 1620. With great prizes from our sponsors, live DJ, dancers, a huge crowd and MC Luke Van Valin on the mic, it’s sure to be another glowing highlight to the summer! Back by popular demand! Our Groms Sessions were a big success last year enabling the 9 – 11 year olds to join the camp. We were blown away by how good some of these young skiers are and are stoked to help them get to the next level. Alex Bilodeau first came to camp at age 11 and with his added World Championship title this year, he plans to come back again to continue to inspire our budding young campers. A reminder that our ‘Bring a Buddy’ discount is in effect again this year. Bring a friend who has never been to camp before and get $100 off your own camp, bring 10 friends and save $1000! Check out our other discounts here. 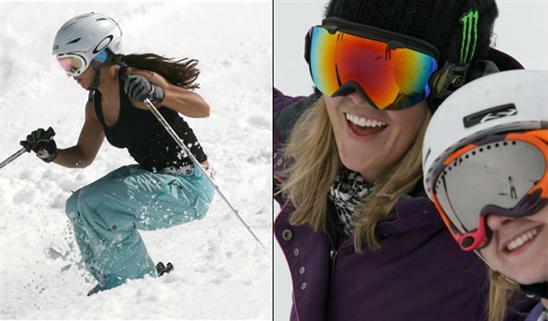 New this year – ‘Bring Your Pet’ (or non-skiing partner!) and we will help them have an amazing time off hill, while you focus on your skiing on the glacier. Whistler’s huge choice of activities will cater to all tastes from adrenaline junkies, to eco-enthusiasts to those who just want a little R+R at the Spa! We can put together a custom activities package in the mornings and they can join in with the camp program in the afternoons and evenings. We can also help you parents with young children attend Adult week and arrange daycare and activities for the kids, while you are FREE to ski!